DOES NOT TEST, unless one or more of the Junior tests were not taken during their 11th grade year, in which case, they should contact Mrs. Durkee or Mr. Crites. The State of Michigan has put together a presentation with information on assessments. A copy can be found below, or online at michigan.gov. Visit the State of MIchigan Assessment and Accountability page by clicking the button here. 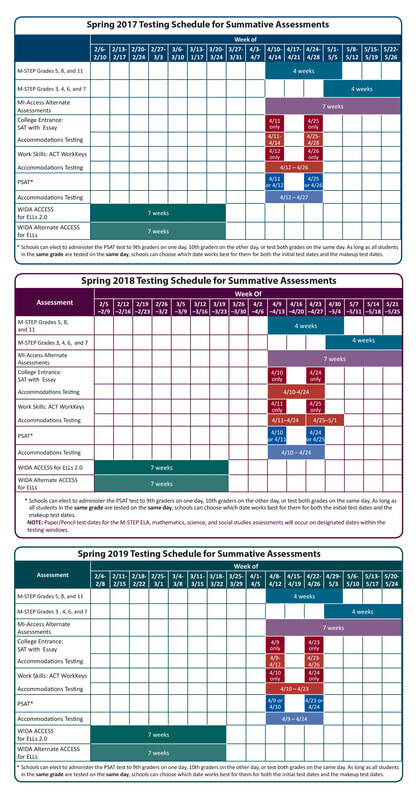 The following calendars show the testing windows for the Spring 2017, 2018, and 2019 Summative Assessments. The M-STEP paper/pencil test dates for English language arts, mathematics, science and social studies will occur on designated dates within the testing windows.